Thinking of a Puerto Rico Elopement? Weddings are not one-size-fits-all events. Thanks to the increased access to travel, many couples opt out of the traditional weddings, choosing instead to elope to exotic, beautiful places where they can marry without strict timelines, investments, difficult compromises, and long guestlists. Most couples are OK with just an officiant and a set of rings, but in recent years, couples are increasingly opting for booking several services such as decor, transportation, hair, and make-up, and photography in order to have a mini-wedding just for the two of them. After 10 years in the Puerto Rico wedding industry as a local and destination wedding photographer, I've increasingly grown to love elopements as a therapeutical break from big and flashy wedding days. No matter what you have in mind for your Puerto Rico elopement day, I'll be there to help! I'm not a planner for traditional weddings, but because of the simplicity of elopements, and the direct impact that every single decision has on my photography output, I usually help couples plan out their elopement day providing them with hot tips, vendor connections, guidance on choosing a location, and finally crafting a timeline together. 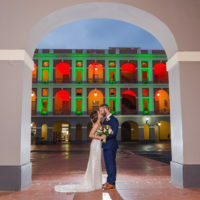 Each Puerto Rico elopement is unique! This is why after booking your elopement date, we'll go over all the details such as location selection and itinerary planning. Depending on the kind of scenery you're interested to have as a backdrop when you exchange vows, I'll help you find the perfect location and will set up the perfect timeline to have your ceremony and wedding portraits. Get the dream team. We'll put you in touch with tried-and-true wedding professionals that also specialize in a personalized elopement experience. The perfect officiant to marry and provide you with information on the legal marriage requirements in Puerto Rico. The best floral designer in case you want a bouquet, flower crowns, or boutonnieres. Experts in bridal make-up and hair so you look flawless in the Caribbean heat. Professional wedding videographers to capture every word and instant. Transportation to and from your elopement location for you and your guests (if any). With over ten years of experience in traditional and non-traditional wedding photography, you'll have gorgeous professional wedding portraits without having a big wedding! 15 days after the elopement you'll have a full gallery with all final photos of your day in full resolution format, so you have great memories from your wedding day to share with loved ones. Albums and print products are also available upon request. I only book one shoot or wedding per day, by filling the contact form below you'll get access to the full pricing and services catalog right away! What is there not to love about Camille? She is sweet, friendly, professional, fair, and extremely good at what she does. I found her on Yelp (full review on there) because I sent out a request for proposal for all photographers in Puerto Rico, as my husband and I were getting elopement pictures done late June and we didn't know anyone in PR. Camille was one of about 7 vendors to respond to my inquiry (in just about an hour or 2) and just by looking at her work on her website (camillefontz.com), I knew she was the one. In terms of pricing, she was just right, trust me. Honestly, I think Camille's pictures are more unique and cater towards the mood of the couple anyway. She was super accommodating and very modest. She spoke perfect English so it was very easy to communicate all my crazy requests. On the day of the shoot, we had to change the venue unexpectedly and she didn't mind, no sweat. She showed up about 30 minutes early so she could get ideas on where to shoot and scope out the location beforehand. She even hand delivered the bouquet I ordered from Glow Events! She gave direction for posing when needed but as soon as she saw my husband and I relaxed, she began to allow us to take lead and quietly followed us around switching lenses every so often. The poses progressed very naturally. In the end, we had about 250 pictures all with amazing results. Overall, I would highly recommend Camille because from the moment she reached out, I trusted her. Entrust your most precious moments with a photographer that is friendly, laid back, modest, and professional. Thank you Camille Fontanez for capturing our day with your beautiful work!